Of course he prefers the one with the penguin. In 2014, ad-agency adam&eveDBB scaled the heights of advertising excellence with Monty the Penguin: a story that was as moving and effective as it was insightful and succinct. However, after this lofty pinnacle at the end of several years of highly-successful Christms adverts, John Lewis lost their way, and this year’s one-dimensional and undistinguished offering fails to restore their position. Of course, there are few things in life that aren’t improved by a penguin. If you’re not a fish, penguins are lovely. My favourite urban legend concerns a penguin. It was told to me in all seriousness by my mother when I was about 15. A young boy on a school trip to Dudley Zoo had noticed how the profile of penguins so closely matched that of the duffle bag he was carrying: the old-fashioned round sort with a drawstring at the top. Somehow he managed to pop one in when no one was looking, and his theft was only discovered in the coach on the way home. It’s an almost perfect urban legend, as defined in The Vanishing Hitchhiker, a wonderful book written by Jan Harold Brunvand in 1981. The story is implausible but there’s an attractive resonance to it and a nice bit of local detail. Most importantly, and this is the sine qua non of an urban legend, at least in its early stages, it was told to my mum by someone who knew someone who knew the people it had happened to. Those three degrees of separation crop up time and time again in the birth of urban legends. And, once you stick a penguin in the story, everyone wants to believe it. Although I stay up-to-date with Christmas adverts, I am often one or two series behind with Attenborough-narrated nature extravaganzas. Just as Dynasties is rolling across our screens this autumn, complete with penguins –– well, the marketing people aren’t mad are they? -–– I thought it was about time to start watching Planet Earth II, a six-parter that first came out two years ago. There is one scene from this series that everyone seems to remember, and it comes in the first episode. In the Galapagos, young marine iguanas hatch from the sand and pelt across an open beach to the sea’s edge, pursued by deadly racer snakes. Even without a snake phobia it is pretty chilling; if you have one, it must be terrifying. However, the sequence that I found most affecting came near the end of the programme, on sub-antarctic Zavodovski island, where the world’s largest colony of chinstrap penguins was raising its chicks under a malevolent canopy of circling skuas. Every day, one of the parent pair had to leap from storm-battered rocks and cliffs to feed in the chilly but fecund waters of the South Atlantic, returning within 24 hours with a full belly to share with the growing chicks. Then the other parent would take its turn with the hunting. Notwithstanding the difficulties of finding the right mate and offspring in a colony of 1.2 million birds, the most perilous part of each expedition was getting into and out of the sea, with a shore-line of jagged lava and surf spurting tens of feet into the air. The main programme contained a shot of one penguin returning to its nest bloody but unbowed –– black and white and red all over, as the old joke goes –– but the short Diaries segment at the end, which generally goes behind the scenes and explains how certain scenes were shot, hinted at images of much more devastating carnage. They didn’t show many of them here –– well, the marketing people aren’t mad are they? -–– but they did show a few more shots of bloodied birds and, most distressingly of all, one poor penguin trying to limp home with a clearly broken leg. It was about two seconds of film, but it has stayed with more more than the rest of the hour. That penguin looked in a really bad way, but he (or she) wasn’t giving up. If it failed to shuffle its way the mile or two across volcanic ash and tephra to find its mate and chicks, then it and the chicks would die, and its mate would face the agonising choice of leaving its chicks to the skuas or staying to starve to death with them. If it managed to get home, relieve its mate and feed its chicks, then everything would depend on whether it had enough strength and mobility to fend off the skuas, and whether its mate was able to do back-to-back hunting trips continuously for weeks to keep both its chicks and its mate alive. Both looked extremely doubtful. That family was doomed. It is not hard to find examples of unimaginable harshness in the natural world, but this one touched me on the raw. There are no safety nets on Zavodovski island; no welfare organisations; no hospitals for the injured or hospices for the dying. It made me reflect on the fact that, of the quintillions and sextillions (and whatever comes next) of animals that have squirmed, wriggled, swum, walked and flown upon the earth since animals started to exist, probably the vast majority of them have died either as a result of starving to death or of being eaten alive. 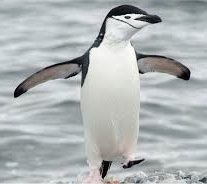 Ironically, the million or so chinstrap penguins of Zavodovski island may well have been exceptions to this tendency. Earlier in the same year as that first showing of Planet Earth II, Mount Curry, an active volcano that is also known as Mount Asphyxia, started to erupt and shower the colony with hot ash and smoke. With the chinstraps undergoing their annual moult, the birds would have been unable to escape by swimming away. Anyway, my point is simple, in the developed, western world, one has to be very, very, very unlucky to suffer a fate so pitiless as that of the poor bird who touched my heart. However bad things get for the vast majority of us, it’s never as bad a being a penguin with a broken leg. Last weekend I attended my second get-together of psychotherapists since moving to Scotland. Both have been very good, and I may write about the first in the weeks to come, but for now I just want to mention Saturday’s event, the Annual Conference of UKCP’s Scottish Public Policy Forum. It was held in a building that looked a bit like an up-market borstal, just off Sauchiehall Street, and there was a modest turn-out of some 25 people. Not only was the event free, but it also featured a very good free lunch. The theme for the day was holding. In psychological terms, holding is the process which provides safe frameworks within which a person (i.e. a client) may feel supported, and be encouraged to express emotions safely and reflect on those emotions and understand them. It is similar to, but not quite the same as, the psychotherapeutic concept of containment. The key thrust of the day was the presentation of a report called: Holding and Distress: Considerations for the community’s response to severely distressed people, but to be honest I found it as woolly and unsatisfactory as I do all social science. More interesting was a presentation by Susie Lendrum, who talked through some of the things that can go wrong in small therapy-providing organisations when therapeutic principles are not woven well into management structures. Theo Dijkman and Eileen McAlister did an exercise to show how instrumental relationships can get tangled and twisted in a real case issue. Watching seven middle-aged people standing in the middle of a circle and tying themselves up with string took me back to training days, and gave me a few moments of deep happiness. It is strange but I have really liked both of the events I have so far attended in Scotland. Back in Sussex I couldn’t get home fast enough, and always took myself off at lunchtime and breaks. I am not a great one for networking and had little curiosity about my colleagues. Here in Scotland, I linger and chat. I find out about people. I talk to them, get ideas from them, and exchange contact details. What on earth is going on? It’s not that the soil up here is rich and fertile. Most often the talk is of how difficult it is to find clients, how far people had to travel to find a training, how Scottish culture does not lend itself to asking for help or expecting to find it. We are beasts of a sparse and unforgiving habitat. We might not quite be classified as critically endangered, but we are perhaps in the “vulnerable” category. It is making me a better neighbour. Adversity appeals to me. Like the chinstrap penguins, huddled together on the acrid slopes between Noxious Bluff and Pungent Point (I am not making this up), Scottish psychotherapists are holding on. When Elsie was still a puppy we had a short holiday in Norfolk, in a substantial village called Laxfield. On the last day I treated myself to half-an-hour in the fine parish church, which has much to recommend it still, despite the depredations of the Reformation which were particularly enthusiastic in those parts. But I don’t remember the fine dimensions or the superb fifteenth-century Seven Sacraments font so much as a simple poem I found in the south aisle, clearly the work of a local school project. A thirteen- or fourteen-year-old girl had written very touchingly about how glad she was that she lived in Laxfield. I wish I had photographed the poem, and had the words to hand now, but I have never forgotten the sentiments. I realised that I had never, ever felt such a simple sense of belonging as that young lady managed to convey. Nevertheless, as time wore on, I did catch the odd moment of pride for the town that had seen me to adulthood. There was the Sunday lunchtime I was sitting in a country pub a few miles west of Wolverhampton, listening to a family who had clearly come out for the day. Three generations of Wulfrunians were arguing about the Latin names of birds, and my heart did a little flip of pleasure as I listened to them. Then there was a visit to the Black Country Museum, on a grey autumn day when the smell of small coal, artistically piled up in the rain, took me straight back to the open fires of my childhood. In the cafeteria, by late afternoon there remained just three types of sandwich. Next to a “Three-Cheese Sandwich” was the altogether more affluent “Four-Cheese Sandwich”, overshadowed only by its neighbour, the “Five-Cheese Sandwich”. You have to admire a place for spotting a good idea and running with it. It was not really until my mid-fifties that I began to feel the warmth of the region that grew me, and nursed the faintest of thoughts that perhaps, one day, I might live there again. Recently I watched, The Boy with the Topknot, a TV adaptation of Sathnam Sanghera’s attempts to reconcile his Wolverhampton family with the new life he had made for himself in London. The contrast between his life and mine left me in tears. And now I live in Stirling. Stirling is not just in Scotland, it is at the heart of Scottishness. A brisk ten-minute ascent from my front door takes Elsie and I to the gates of Stirling Castle. There a statue of Robert the Bruce stares heroically down to the Thistles Shopping Centre, and tourists are sure to get him pictured against the massive monument to William Wallace, a mile-and-a-half away across the Forth. William Wallace won his defining battle at Stirling Bridge, just below the castle walls, in 1297, while Robert I won the battle that gave birth to true Scottish nationhood at Bannockburn, which is now a suburb of Stirling, two miles away to the south. There another statue of King Robert presides over the Bannockburn memorial and Elsie’s new vet’s. Wallace, not to be outdone, has his second memorial beneath the clock-tower in the centre of town. Within a few yards of the castle walls there are monuments to Robbie Burns, Rob Roy and Sir Henry Campbell-Bannerman, Scotland’s last successful Prime Minister. There is even an information board about Billy Bremner. Stirling was the capital of Scotland from the twelfth century until after the Stewarts moved to London to succeed Elizabeth. Mary Queen of Scots second husband, Lord Darnley, played the second oldest-recorded game of golf at the end of our road, and their son, the future James Vi and I was anointed in the Church of the Holy Rood, at the town end of the castle mound. James III is buried here, near the spot where, much earlier, the great Kenneth Macalpin defeated the Picts to become the first king of a united Scotland. Stirling has been called the “Gateway to the Highlands”, and “a huge broach that clasps Highlands and Lowlands together”. “He who holds Stirling, holds Scotland”, it is said, a point that has been demonstrated, in bloody detail, on numerous occasions over the centuries. When I step outside my back door in the all-too-brief summer months, I hear bagpipes from the castle ramparts above. It is hard to live here and pretend I’m still in Sussex. I would ask myself what it meant to belong somewhere. What does it mean to be part of a community? For me, it wasn’t necessarily about being in a particular geographical location. It was about being seen and heard and acknowledged by the people I lived amongst. And also me seeing and hearing them too. Belonging is about having connections and relationships with others, they are the light in which we shine and flourish. As Carl Rogers himself said: ‘When I have been listened to and when I have been heard, I am able to see my world in a new way and move on.’ Without this sense of belonging, or being seen and heard, an important part of me was slowly withering away. Belonging and being part of a community is the blood that keeps us alive, it is the magic that holds people together. Lonely people tend… to be lonely because they decline to bear the psychic costs of being around other people. They are allergic to people. People affect them too strongly. I quibble a bit at the word “lonely”, but I know what he means. In some ways it would be nice to be seen and acknowledged by the people I live amongst, but in others it would be an awful lot of trouble. Surely there are other ways of belonging? Taking Scotland to heart is a challenge, of course, but perhaps not an impossible one. All the same, however good I get at it, however much a feeling of belonging I ever manage to generate for myself in this place, there are always going to be those who did it better. The castle hill in Stirling is home to five separate cemeteries, and some of them have glorious views over to the Ochil hills and the Forth flood plain. They all nestle against the stalwart protection of Stirling’s medieval castle walls and are anchored to their rocky outcrops by heavy, handsome trees and soft peaty turf. One of the smaller ones is the Snowdon Cemetery, facing westwards on the shoulder of the castle mound. On the right of the entrance are a number of Italian graves: settlers who lived here for generations and whose descendants are undoubtedly still around, but on the north side is an even more touching memorial. 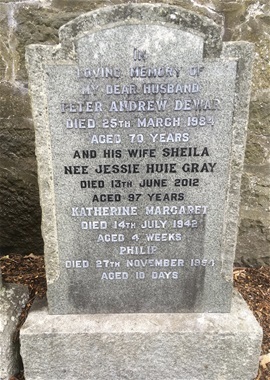 It is dedicated to the memory of Peter Andrew Dewar who died in 1984, and two tiny babies: Katherine Margaret, who died in 1942, aged four weeks, and Philip, who died twelve years later at 10 days of age. The most striking thing is that the stone was placed there by Peter’s wife and the mother of the two dead children, Sheila, and she died in 2012 at the age of 97. Her name is inscribed in black, in contrast to the white lettering of the rest of the family. Clearly the stone was erected perhaps as much as twenty-eight years before Sheila died, with a suitable space left for her when she did. Sheila Dewar knew where she belonged: between her husband and her children. Her name was going into that space on that stone, no matter how long she had to wait. There was nowhere else for her to be. That is belonging.